UPDATE: Moving Schools Project – The roof goes up! After a great weekend, with the arrival of the fabric roofing and flooring material for the school build we were very eager to start putting up the roofing system and turn the project from a steel frame into a complete building. The workshop apprentices were now working on site at the school where they were using a generator to construct the larger roof frames on site. 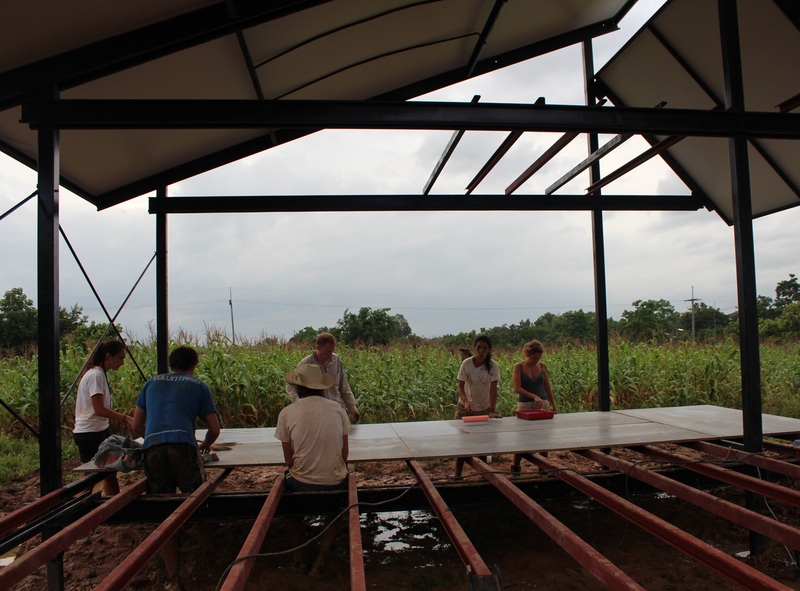 Once a large frame was built by the team, the plastic roofing fabric was fitted to the frame and then a team of workers would lift the frames into place over the steel frames.With the rain not stopping we decided to try and place the first small roof in place. 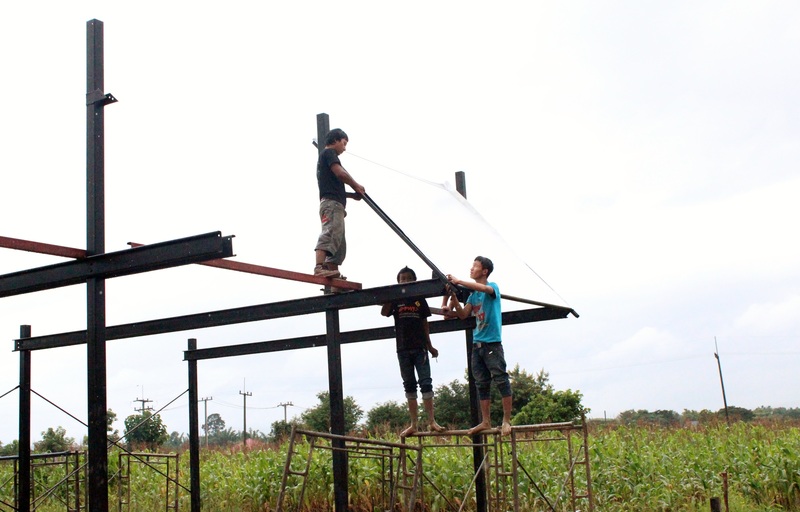 Paul from Youth Connect climbed onto the steel frame as Aung Myint Soe and David pushed the small frame into position. It was great to finally see a roof section in place and to find out that the plastic roofing caused no sound when the rain hit the roof. With the first small roof in place the next day the team decided to lift a large frame into position to complete the first school module. With scaffolding carefully positioned around the steel frame the team slowly manoeuvred the large roof into place and within a few hours the first two school modules were fitted with roofing system. As the roofs were fitted the volunteers moved the Viva floor boards into place on the school module and the boards were painted. Both top and bottom of the boards were coated in acrylic paint. This layer of paint will provide an essential waterproofing. After the floor boards were painted David used self tapping, countersunk screws to attach the boards at 50mm centres to the steel floor joists. Slowly we could see the school modules creating an interesting new space which would become the classrooms for the Thu Kha Hang Sar students. As the floor boards and roofs were being fitted, we began to research a supplier for bamboo blinds which would be fitted to the steel frames adding extra protection from the weather to each module. 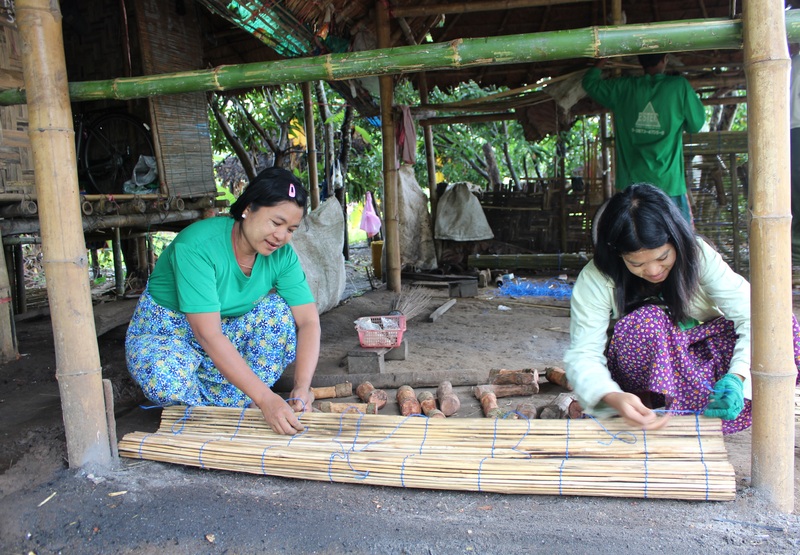 We were very happy to find out a family in a nearby village manufactured bamboo blinds from their home. Driving through the rice paddie fields and across a winding path led us to where the family created the blinds. We discussed the designs with the family and they agreed to make 30 blinds for the school in two weeks. The family would cut and smoke the bamboo before weaving the bamboo with nylon to create beautiful blinds. It was fantastic to be providing the local community with work and great to see even more local produce being taken into the final design. 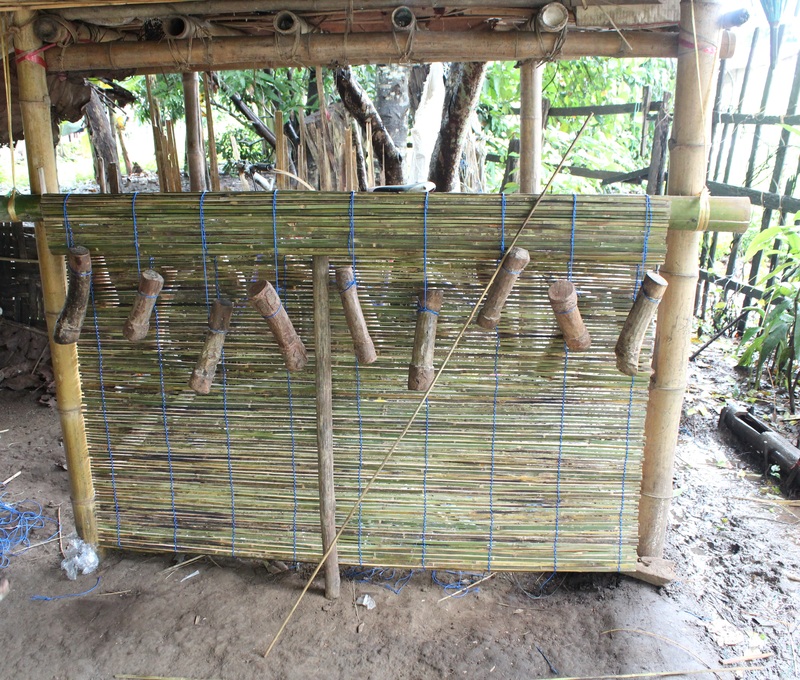 After collecting all the blinds from the local village they were taken to the Youth Connect workshop to be painted with a lacquer to protect the bamboo from insects and water damage. We really looked forward to bringing all the school materials together to see the final school design. It was great to see more of the roof in place and begin to get a feel for the space and overall design of the building. We were really pleased with the plastic fabric which looked spectacular above the steel frame. 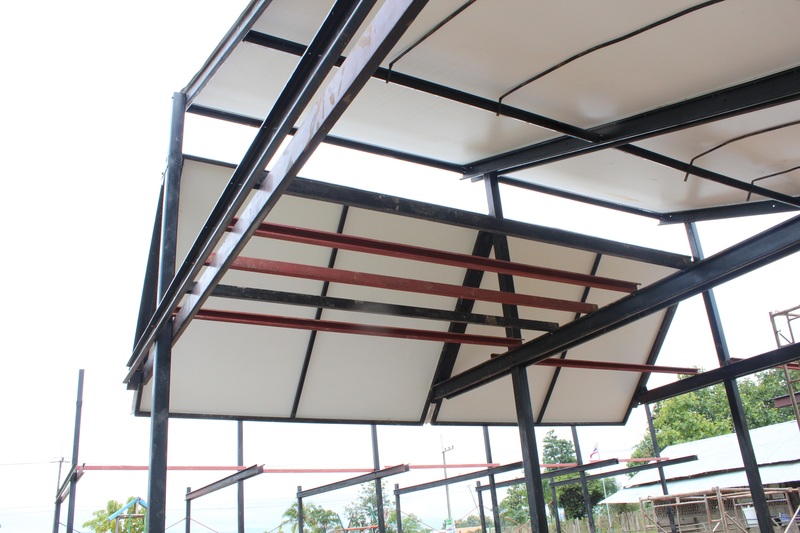 The roofing system will provide the students with a quieter classroom environment, sun protection and better ventilation provided through the angles of the roof. Meanwhile, in the workshop further Burmese workers were employed to finish the bamboo wall panels. 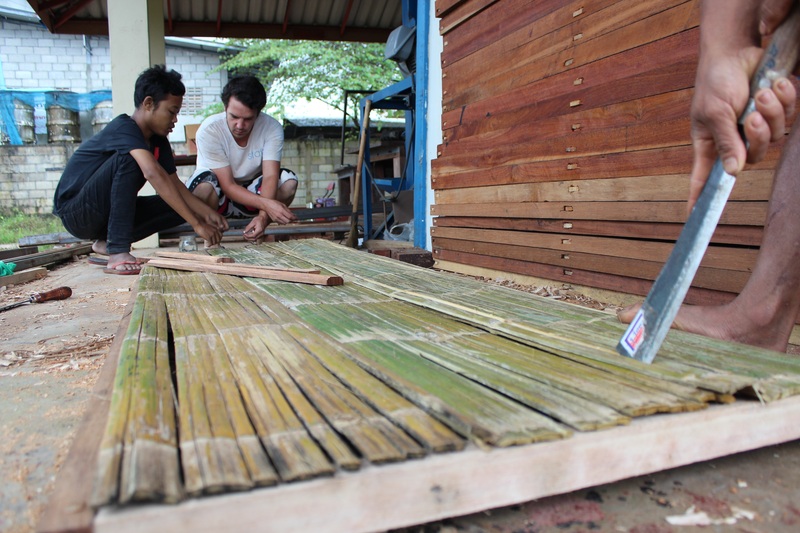 A team of two spent two weeks constructing 60 bamboo panels which would create the walls for the school modules. It is great to see all the components of the build coming together and we are looking forward to seeing the finished school build very soon.